The famous brothers Grimm traveled throughout Germany, I heard and recorded a huge number of folk tales. One such work is the popular fairy tale "Rapunzel". The brothers Grimm fairy tale "Rapunzel"
As already mentioned, the fairy tale "Rapunzel" (Rapunzel) appeared in the collection of the famous brothers during their travels in the territory of modern Germany. The tale tells the story of a young and beautiful girl with very long hair, which from an early age was imprisoned in a high tower away from human settlements. Fairy tale "Rapunzel" was repeatedly translated into many languages. However, it was not created by the brothers is a folk creation, which describes a collective manner and customs of the time. According to history, next to the sorceress lived a married couple. Once pregnant wife saw that in the garden, the strange neighbor is growing a delicious salad, and unable to fight the desire to taste it, convinced her husband during the night to steal her treats. The poor husband agreed to get his beloved wife of salad, but when the mining was going to go back, the witch who caught him. Oddly enough, the witch agreed not just to let go of the thief, she allowed him to take the salad in any quantity. Instead, she took a promise from her husband to give her firstborn. Later the girl was born, the witch took the baby and gave her the name Rapunzel. The unusual name was chosen for a reason. The word "Rapunzel" and means the same delicious green salad, like a real mother. Unlike the disney fairy Rapunzel was banished by the witch in a dense forest in love with the Prince, and the latter was blinded. Also lovely girl was the daughter of poor peasants, not of the Royal couple. When Rapunzel and the Prince met again after years of separation, her tears returned Prince sight, and then they lived happily until the end of his days. 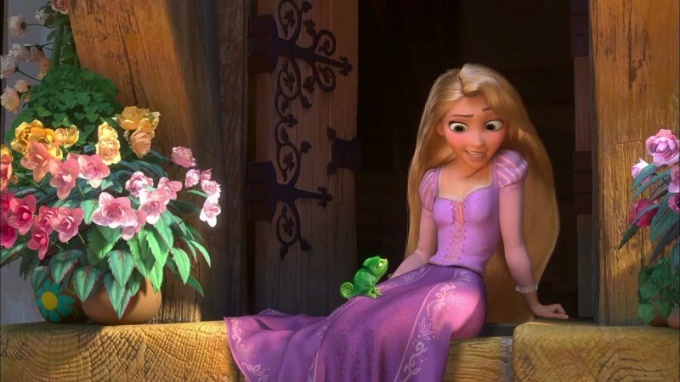 The most modern adaptation of the fairy tale - cartoon Disney "Rapunzel: a Tangled tale". Original tale and all existing adaptation are quite different from each other. Rapunzel - edible plant of the family Valerian. Similar names - Valerianella spike, Valerianella garden, Field salad. In Russia, this type of lettuce is grown is extremely rare, but in Western Europe it is very popular. Presumably, that's what this salad was implied in the story. There is also a view that this could be a bell Rapunzel, but the German valerianic sounds like "Rapunzel," when the Bell is translated as "Rapunzel-Glockenblume". Therefore, most likely, we are talking about a Field salad. By the way, it is because of this confusion, the first translation of the works had a different name. It was a "Bell" in the translation of Peter Field, and even met a translation of the tales called "Salatka".